A small US congregation can use hallucinogenic tea as part of its rituals to connect with God, the Supreme Court has ruled. The unanimous decision is court's first religious freedom case since Chief Justice John Roberts was appointed. The hoasca tea is considered sacred to members of the group, O Centro Espirita Beneficente Uniao do Vegetal. In its ruling, the court said the government must allow the use of the tea under religious freedom laws. Mr Roberts wrote that federal drug agents should have been barred from confiscating the tea. However, the justices sent the case back to a federal appeals court, which could consider more evidence. The administration of President George W Bush had argued that the tea was illegal and potentially dangerous. Members of the group believe they can understand God only by drinking the tea, which is consumed twice a month at four-hour ceremonies. The brewed tea, made from two plants that grow in the Amazon, contains dimethyltryptamine, or DMT, a controlled substance banned under federal drug laws. About 130 members of a Brazil-based church were involved in long-running dispute with federal agents, who seized their tea in 1999. Mr Roberts, a conservative, was appointed to the court last year. 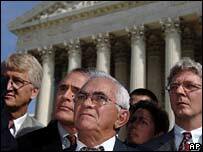 Since he replaced another conservative, William Rehnquist, that change was not thought likely to affect the court's balance.